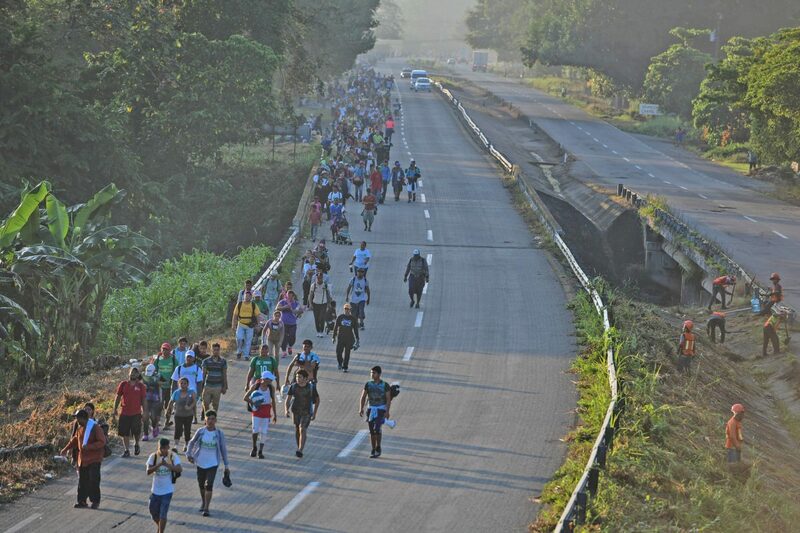 Thousands of Central American migrants continue their journey toward the U.S. border Wednesday, Oct. 24, 2018, reaching the Mexican coastal town of Mapastepec. An estimated 7,200 migrants from Honduras and other countries have pressed on, sleeping on roads, traveling on rafts, going without food and water and facing police and threats from President Trump, who called them a "threat" and vowed to send troops to the border. As the Central American migrant caravan numbering in the thousands continues its trek northward, Rio Grande Valley congressmen are reacting to news of a potential military deployment of 800 or more additional troops to the U.S.-Mexico border in Texas. Representatives from U.S. Border Patrol declined comment and instead referred inquiries to the U.S. Department of Homeland Security. Emails and calls left for DHS have gone unanswered as of press time. U.S. Rep. Vicente Gonzalez, D-McAllen, who met with DHS officials in Washington Thursday afternoon, said the number of troops deployed to the area would depend on where the caravan ultimately arrived. He also characterized the announcement as theatrics, and more campaign rhetoric from the administration. “This caravan is not the result of a crisis at our border, this is the result of instability, insecurity, and lack of opportunities in Central America. Deploying more of our troops to the U.S.-Mexico border is not the answer, and it represents the administration’s continued failure to heed the advice of members of Congress that represent border communities,” he said. Gonzalez said that instead of sending troops, who are only performing non-law enforcement duties, there should be more funding for open slots with U.S. Customs and Border Protection, which protects ports of entry. U.S. Rep. Henry Cuellar, D-Laredo, reiterated his stance from April Thursday regarding the announcement of the additional deployments, saying he’s against militarizing the border, but that the troops would not be armed, and only acting in a “surveillance and administrative” role, according to a prepared statement. “Border and national security is an important issue I take great interest in as a member of Congress who represents a large area of U.S.-Mexico border,” he said. “I will continue to monitor the caravan’s movement and support sensible policies that improve border security in a responsible fashion,” Cuellar said. The announcement comes more than six months after a similar deployment of troops to the border in early April, when Defense Secretary Jim Mattis approved paying for up to 4,000 National Guard personnel from the Pentagon budget through the end of September. A memo from the U.S. Department of Defense stated at the time that guard personnel would not perform law enforcement functions or “interact with migrants or other persons detained” without Mattis’ approval. Of the 2,100 troops currently deployed on the U.S.-Mexico border, 1,000 are in Texas. The deployment then came on the heels of U.S. Attorney General Jeff Sessions’ announcement of the “zero-tolerance” policy in a memo to federal prosecutors in each U.S. Attorney’s Office along the southwest border. Sessions urged a zero-tolerance policy with regard to illegal entry and re-entry cases. Sessions at the time cited the Department of Homeland Security’s report about spiking illegal border crossings in March, showing an increase of 203 percent in illegal crossings from March 2017 and March 2018. Another report shows a 37-percent increase of the same infraction from February to March of this year. Gov. Greg Abbott cited the same statistic during his visit to the Rio Grande Valley on April 12, saying that the increase was concerning and the main reason for the deployment of troops, not the caravan making its way to the U.S. That caravan, which began as more than 1,500 strong, ended with about 200 people making it to the Tijuana border with the U.S. Regarding deployment of troops, Texas Military Department Public Affairs officials referred all inquiries to the Office of the Secretary of Defense, Lt. Col. Jamie Davis, who has not responded to requests for comment as of press time.